Olam International (Olam) was established in 1989 by Kewalram Chanrai Group to secure hard currency earnings and the business began with the export of cashews from Nigeria into other countries. Between 1993 and 1995, the business grew from a single operation into multiple origins, first within West Africa including Benin, Togo, Ghana, Côte d'Ivoire, Burkina Faso, Senegal, Guinea Bissau, Cameroon and Gabon, and then to East Africa Tanzania, Kenya, Uganda, Mozambique, Madagascar and India. Today Olam is the leading agri-business operating from seed to shelf in 70 countries, supplying food and industrial raw materials to over 16,200 customers worldwide. Olam’s base in Cameroon alone has over 200 employees and recently, they were looking for a solution to automate the management of their growing workforce. FingerTec’s reseller Electronics Diffusion & Services recommended FingerTec AC100C fingerprint system for time and attendance because of its cost, effectiveness and ease of use. The need to switch to a fully computerized and systematic attendance system arrived upon recognizing that keeping track of their employees’ time and attendance closely can help the business control cost, compliance and productivity in one shot. AC100C appeared favorable to Olam as it is a biometrics time attendance device, with precise fingerprint recognition capacity. It is no secret that biological attributes are primarily based on an individual’s anatomy, which cannot go wrong and takes a great deal of effort to fiddle with. Loop holes such as buddy punching, time stealing, and other attendance related disciplinary issues were relatively reduced within months of the new implementation. What else was noticeable was the effortless compliance from their employees towards the house rules. For instance, there was a significant decrease in the number of late comings, short disappearance, and other forms of absenteeism. This as a whole increased productivity and left no unrecorded conducts especially concerning attendance. The management is now left with more time to focus on the business operations rather than spending extensive babysitting moments with their employees. 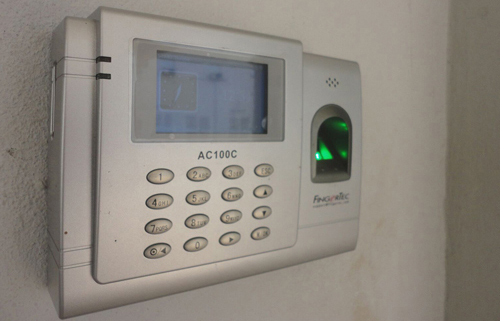 Additionally Olam has also installed a few sets of FingerTec i-Kadex and R2c that is all centralized via an Ingressus Controller to access control and monitor visitations on several restricted areas within the building. Complementing these physical biometrics devices is the processing software Ingress that is easy to use and comes with comprehensive features such as real-time monitoring, database administration and report management, all in a single unified system. Keep in touch with us at info@fingertec.com for any question at all and we'll attend to your enquiries at the soonest.